These South Dakota Landlord Tenant Laws are a summary of laws and is not an exhaustive list of all relevant laws and regulations, and it is not intended to be legal advice. Laws are subject to change, and will often vary from within the state from municipality to municipality. Should you have any legal concerns or questions regarding South Dakota Landlord Tenant Laws, we highly recommend that you consult with a qualified attorney. Many local and state bar associations have referral services that can assist you in locating an attorney. Stay up to date on South Dakota Landlord Tenant Laws + Save money on tenant screening and other property management needs. Join AAOA today, it’s FREE! Maximum Security Deposit Amount: Yes. A landlord is permitted to charge a tenant a sum equal to one month’s rent. However, a landlord may charge a higher deposit if special circumstances pose a potential danger to the premises’ maintenance. SDCL §§ 43.32-6.1 and 43-32-24. Return of Security Deposit: A landlord is required to return a tenant’s security deposit within two weeks after the tenant has moved out of the premises. Within that two week period, the landlord is required to return all of the security deposit or a portion of the security deposit. SDCL §§ 43.32-6.1 and 43-32-24. Deductions from Security Deposit: A landlord must give the tenant an explanation as to why any deductions were taken out. Should the tenant request a written and itemized accounting of the deductions, a landlord must provide this information with 45 days of the tenant’s request. SDCL §§ 43.32-6.1 and 43-32-24. Late Fees: No state statute. However, if your lease agreement is silent on the issue of late fees, a landlord may not impose a late fee. Notice for Rent Increase: A landlord must give a tenants at least one month’s notice in writing regarding any rent increase, or to change any term of a month-to-month lease agreement. In the event that you have a long term lease, a landlord may not increase the rent until the lease has terminated, and a new tenancy period commences (unless, of course, the lease itself stipulates for a rent increase.) SDCL §§ 43-32-13. Termination for Non-payment of Rent: South Dakota law requires that a landlord give a tenant a minimum of three days in which to pay the outstanding rent or move out of the premises. A landlord can terminate with an Unconditional Quit notice. SDCL §§ 21-16-1(4) and 21-16-2. Meth Labs: South Dakota law requires that any landlord who has actual knowledge of any prior manufacturing of methamphetamines in the unit or on the premises to disclose such information to the tenant or any potential tenant. In the event that the premises includes two or more housing units, the disclosure requirements will only apply to the specific unit where there is knowledge of the existence of any prior manufacturing of methamphetamines. SDCL §§ 43-32-30. Basic Rights: All tenants in South Dakota are legally entitled to a unit that meets basic health, structural, and safety standards, and that is in good repair. Landlord’s Responsibilities: A landlord must keep the rental unit in reasonable repair and fit for human habitation, including the maintenance of all electrical, plumbing and heating systems. A warranty of habitability cannot be waived or modified by the parties to the lease agreement. However, the parties may agree to have the tenant responsible for certain repairs in lieu of paying rent. SDCL § 43.32-9. Tenant’s Remedies: If a landlord fails to repair a tenant’s rental property, the tenant may: (1) vacate the premises, which will discharge the tenant from any and all further obligations under the lease, or (2) make the repairs, and deduct the repair expenses from the rent due. SDCL § 43.32-9. Notice: Prior to the tenant taking action on either of the above measures, the tenant is required to give the landlord written notice of the repairs that are required. The tenant’s notice should specify what repairs are needed and the deadline for making such repairs. SDCL § 43.32-9. Unconditional quit notice: These orders require a tenant to move out within a short period of time that is allotted in the lease agreement. In South Dakota, a landlord can utilize an unconditional termination notice for any of the following: (1) three days of non-payment of rent (2) substantial damage to the rental property by the tenant or tenant’s guest, or (3) a tenant holdover. SDCL §§ 21-16-1 and 21-16-2. Eviction: a landlord can file an immediate eviction lawsuit with the court without giving the tenant an opportunity to cure, if the tenant violates a lease clause which provides for immediate termination upon violation. SDCL §21-16-2. Landlord Retaliation: a landlord is not permitted to retaliate against a tenant who has exercised any of the following legal rights (1) complaining to the landlord about unsafe or illegal living conditions (2) complaining to a governmental agency regarding an unsafe or illegal living condition or (3) assembling and presenting collective views, such as a tenants association or tenants union. SDCL §§ 43-32-27 and 43-32-28. Types of Retaliation: South Dakota law protects tenants from the following types of retaliatory acts: (1) terminating a tenancy (2) filing an eviction lawsuit (3) increasing the rent; and (4) decreasing services. 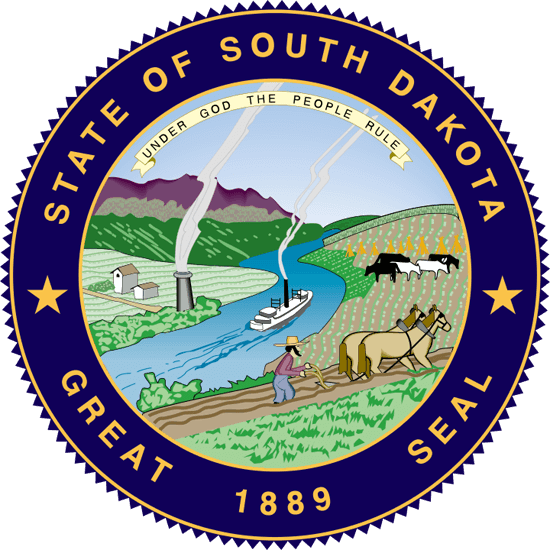 South Dakota state law will presume retaliation if a landlord acts in these types of negative ways within 180 days of the date that a tenant has exercised a legal right. SDCL §§ 43-32-27 and 43-32-28. Landlord Disclosure: No state statute. Tenant’s Rights: No state statute. Application Fee: No state statute. Although there are no statutory limits on the amount a landlord may charge for an application fee, we recommend that a landlord only charge a reasonable fee based upon the locale and circumstances. A key component of landlord tenant laws is also South Dakota Tenant Screening Background Checks. We’ve dedicated an entire page to it because of its importance. Visit South Dakota Tenant Screening Background Checks to screen your tenant. South Dakota Small Claims Court Limits: A tenant may sue a landlord for the amount of the security deposit that a landlord allegedly wrongfully withheld. The maximum amount that a person can sue in South Dakota Small Claims Court is $12,000. South Dakota Unified Judicial System. Eviction Cases : Eviction cases are handled in Circuit Court. Looking for landlord tenant laws outside of South Dakota? The American Apartment Owners Association offers helpful landlord tenant laws for all 50 states. Click on any of the states listed below and go directly to its landlord tenant law page. To visit the homepage of landlord tenant laws, click here.